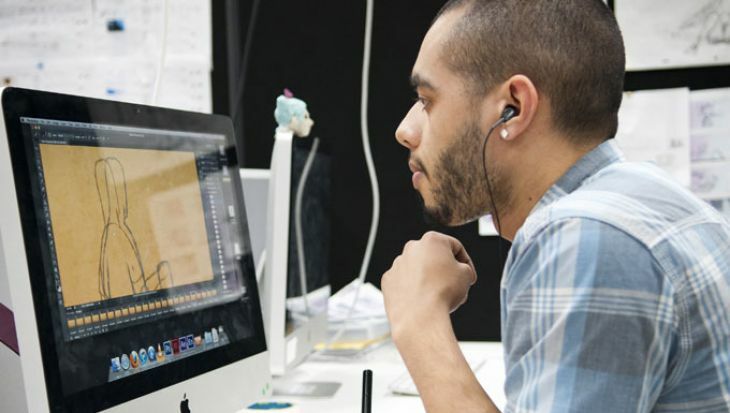 The Digital Media degree has been designed in consultation with industry to create a course which meets the practical, technical and theoretical demands of a career in the fast-moving creative industries. 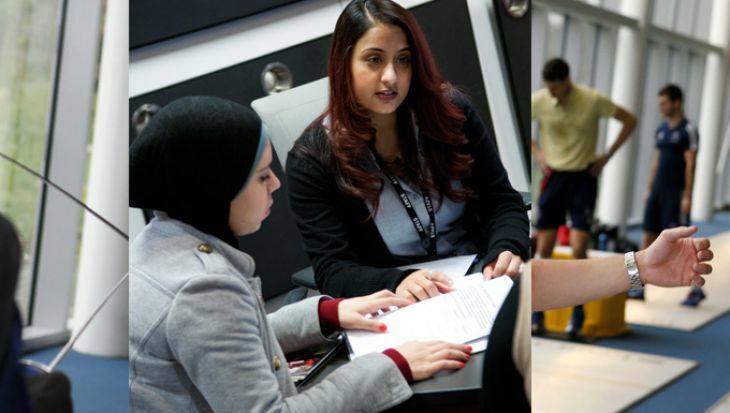 Why study BA Digital Media at Middlesex University? 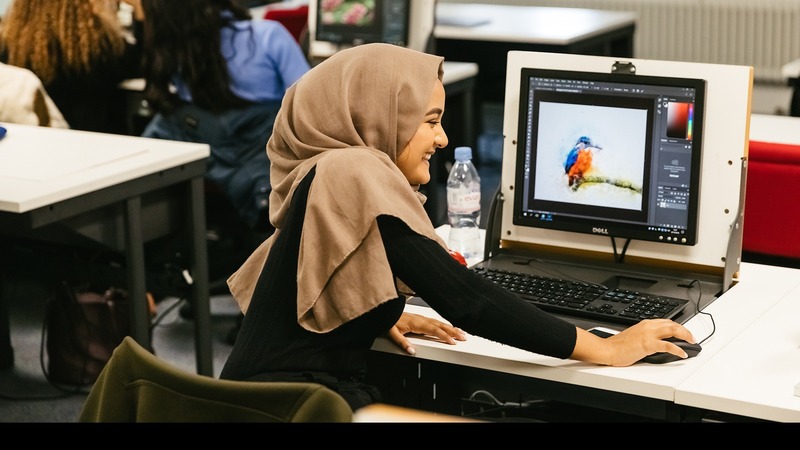 Taught in the University's cutting-edge digital media suites, practice-based work includes video production, web design and HTML programming, data visualisation and smart environments. Great emphasis is also given to the management and analysis of social media platforms, with APIs and other sources used to present and assess social data. What will you study on the BA Digital Media? Practice-based work includes: Video production, website design, information design and editing using Abode Creative Suite, Avid and Apple software, visualisation and informatics, smart environments design. Throughout the course emphasis is given to producing creative works of a professional, industry-standard and high-quality finish. Projects and briefs, tools and facilities provided meet these standards. Each year is made up of four 30-credit modules. In Year One students receive an introduction to Digital Media with four compulsory modules – two theoretical and two practical. In Year Two you can choose one optional module alongside three compulsory, with one of these options providing the chance to do an industry placement. During Year Three you will undertake an individual project and dissertation alongside two additional compulsory modules, with the fourth an optional module. Content in lectures, seminars and workshops explores the local and the global dynamics of networked cultures and their intrinsic connection to contemporary debates about the market, consumer culture, globalisation, hybridity and cultural identity. This module introduces the principles of information design for print and online publications. The module explores the history and theory of typography and the ways typography can be used to communicate meaning. Utilising a range of desktop publishing tools for the creation of visual information designs, the module offers technical skills in the processing of digital images for print and online and introduces methods for the visualisation of data sets. This module focuses on the design, presentation and communication of information for print and online publications. You will gain detailed understanding of the history and practices of information design for both print and online publications. You will be required to use this knowledge to gather, analyse and present information in order to create and communicate meaning effectively. The module focuses on design and layout principles and establishes a good understanding of desktop publishing rules and conventions. The module introduces both industry standard software as well as freeware software for the creation of layout designs online and in print. This module presents key theoretical frameworks with which to examine past, current and emerging practices in digital media. You will review technological developments from the history and development of the internet to the rise of social media today and will be introduce key debates surrounding digital media practices and to examine contemporary examples of digital media cultures. The module takes special focus on theoretical tools and empirical methods for reflecting upon personal and everyday experience of digital cultures, and draws on a range of case studies from popular culture (cinema, video games, media art, social media platforms) in order to explore digital cultures and the role of digital technologies in the shaping of cultural production, popular culture and everyday communication. The module offers a good understanding of political, economic and ethical considerations pertaining to digital cultures. The module is designed with 50% theoretical/50% practical that prepares you for the Independent Project in Year 3– whether that takes the form of a work placement, an extended essay or practice-based work. The module is specifically designed to teach you how to devise and develop independent research projects within the framework of digital media and to train you to use the latest tools and programmes to do research on digital media. The module will instruct you in the design of a research project, including budgeting, basic project planning and management skills, calculation of expenditures, and will guide you across the learning of the new and cutting edge techniques and methods for digital data analysis, such as data scraping and API extraction, data visualisation, basic social network analysis, digital ethnography, social media content analysis, big data analytics, and how these interface with more traditional media research methods such as interviews, questionnaires and focus groups. The module enables you to learn, evaluate and experiment contemporary techniques and approaches in digital media research and apply this knowledge to the design of a research proposal, the development, planning and execution of a research or practical project. This module offers 100% media production skills. The module focuses on media production formats such as video production (DSLR cameras, lighting kits, two-camera interviews), sound recording and mixing, advanced image processing with Photoshop and InDesign Adobe, advanced post-production and video editing with Premier and Final Cut Pro (industry-standard editing software packages). Web design with HTML, live media campaigning, conceptualising and building smart phone applications will also be covered. This module requires to produce practice-based work that is creative and self-reflexive and adaptable to multiple platforms (on and off line). This module requires you to complete a work-placement in a selected sector in the industry. The module runs in cooperation with the Employability Support Services. The work-placement must take place either from January to May or June to August. It offers an alternative option in the event that a work-placement is not secured, in which you must complete a self-promotion portfolio including a professional practice-based project and a critical reflection on present and past professional experience. You will have the opportunity to learn about, consider and discuss the nature of contemporary work in the media and cultural industries and in related fields. This part will explore how people organise their working lives, what types of employment are on the rise, and which are in decline, what exactly are 'the cultural industries', and why are they the subject of so much discussion. The module examines the broader factors surrounding and shaping the types of organisations and industries that your work-placement, and ultimately employment, will be in. Most employers recruiting for interesting graduate jobs nowadays want graduates who are knowledgeable problem-solvers (with equal knowledge in technical production skills), and the lectures and seminar-based part of this module will help develop these skills. The module provides fundamental employability skills in CV writing, letter writing, job hunting and interviewing. Games have become a significant part of our lives. 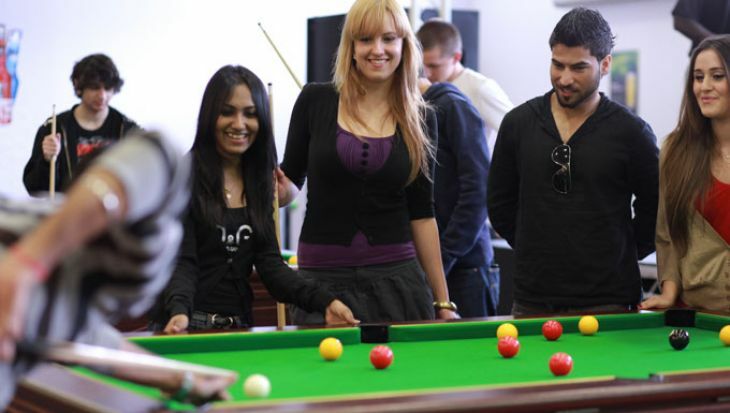 This module will explore some of the important cultural aspects that games have including such topics as ludology, ethnicity, gender, addiction, ethics, gamification and serious games. This module aims to introduce a range of theories, methods and concepts relating to games, animation and digital culture. Close reading of key theoretical texts introduce critical and methodological approaches to further develop an understanding of academic research methods and essay writing skills. This module provides a range of discourses for thinking about visual cultures that will deepen your understanding of other modules and professional practices. This module aims to develop your communication skills and self-discipline by meeting regular essay deadlines throughout the year. The module is designed to combine analysis of texts with a diet of relevant theoretical material to enable you to engage in sophisticated textual analysis. It will draw upon a variety of different primary texts with both general ideas about visual culture drawn from media studies, cultural studies, critical theory and film theory and specialist academic materials on the specific examples given. The independent project module requires you to engage in the development and execution of a sustained project (written or practical) that is relevant to the field of digital media and the study of digital humanities. The module offer skills in professional practice and research with an emphasis on self-directed and independent learning. The module requires to engage critically with theoretical discourses and debates, as well as practical applications of media and technologies - encountered in the course. The project takes one of two forms: a written dissertation project of 7,000 words or a creative, practical industry-standard project accompanied by a sustained critical reflection of 3,500-4,000 words (detailing the process of development and execution) and a business plans (including budget and promotion strategy). This module prepares you for a professional career. The module requires the production of a 'live project' working with a client. This means that you must produce a live project in response to a real-client brief. Through the Media department's industry links, contacts and collaborations with companies from the industry will be encouraged. 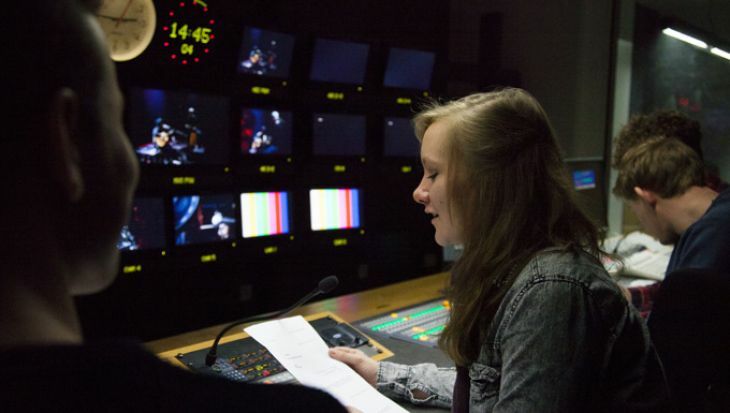 The module gives strong emphasis on employability skills and includes specialist workshops for CV writing, letter writing, interview training, as well as gives access to technical production resources such as the sound recording studio, post production suites and use of the TV studio. You will develop a professional portfolio including business cards, CV and professional profiles on online networking tools and platforms. You will be required to contact clients, agencies and work in close collaboration with professionals from the cultural and creative industries. This module will have the direct support of the University's Employability Support Office. This module offers a balance between theoretical frameworks and practice-based applications of locative media. The module explores the notions of spatiality, temporality, mobility and urbanism through practical applications of locative-media tools and applications. The first half of the module will explore the analysis of theoretical frameworks concerning the changes in spatiotemporal perception brought about by ICTs. The second half will explore hands-on practical applications of contemporary location-based technologies, tools and applications. The module will critically examine the role of new media in the shaping of identities off and online and critically interrogate the representation and understanding of gender by online cultures. The module will use contemporary case studies such as the recent 'gamergate' controversy. Gender, identity and new media is a growing research area in digital humanities. This module will include the most up-to-date critical discourses in this subject and draw from feminist theories in order to create a contemporary understanding of the constitution of gender and sexuality in contemporary society and digital cultures in particular. The module examines the debates surrounding digital media in relation to the frameworks of "openness" that pertain to digital media cultures, and specifically looks at the cultures of sharing and collaborative work, tools and practices. The module builds on prior knowledge acquired in previous modules. The module focuses on advanced contemporary debates in media cultures and takes special focus on the current practices of collaboration and sharing in relation to consumption, work and the creative economy, which stem out of the latest technological developments. The module offers the framework for a cultural understanding of the current notions of openness, sharing and collaboration in the digital media industry and the professional skills required for this kind of practices. You will be introduced to a range of case studies with which to analyse and critically challenge trends and phenomena of openness, collaboration and sharing in relation to a variety of instances, such as collaborative practice for work and labour, co-creation, commons-based peer production, co-design and co-living, and be able to reflect upon your own professionalisation in the digital industry. This module explores key arguments and debates concerning subjectivity, consumer culture and digital media. The module aims to develop knowledge and understanding on the role of new media in shaping cultural identities and especially in relation to the development of global consumer culture. 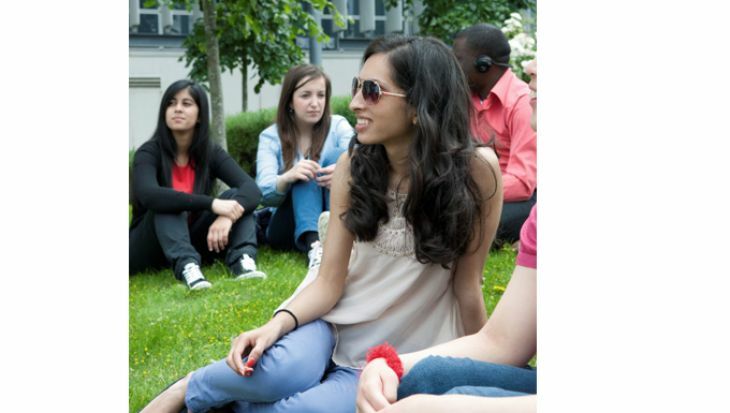 The module develops advanced skills in ethnographic research methods. Since the Enlightenment the way in which the self has been understood and experienced has been central to the development of consumer culture. In recent times it has been argued that it is consumption, rather than any other social factors, that shapes our identities. The purpose of this module is to examine digital media promotional practices under this premise and explore debates regarding the relationship between identity (collective and individual) and consumer culture. How is the BA Digital Media taught? Direct teaching contact in Media modules combines a number of forms – mainly lectures, seminars, workshops, tutorials and online activities. For all students taking a module – lectures are a useful way to discuss key material or approaches, deal with issues, explore questions, concepts and theories, or introduce case study material such as videos, films and other artistic works. In lectures, note taking and listening are essential. Alongside lectures in modules, you will have the opportunity to attend lectures with guest speakers form the creative industries..
For small groups – these are structured, student-led sessions in which you might explore ideas in discussion, carry out practical tasks such as devising or analysing a media product, or practice your research skills. All of these sessions are intended to provide forms of space in which you can discuss and share ideas; as well as develop skills and materials in preparation for assessments. In seminars, reading module materials, note taking and participating in discussion are essential. Actively participating and engaging in seminar discussion enhances presentation skills and the articulation of arguments and ideas and helps you prepare materials for assessment tasks. Similar to seminars but with a focus on practical activities and skills, including: creative group tasks, demonstrations of software packages and media production tolls such as inductions to using DSLR cameras, tripods and sound recording. Active participation, prior preparation, and guided independent study time are required. This includes blog, forum, and wiki participation and is focused on developing writing and communication skills as well as IT and online collaboration skills. These activities aid further development of independent learning skills. Include structured, formal and informal feedback from your tutors on work in progress or on your ideas for a specific module assignment or project task. Much of your learning at university takes place outside class sessions. This encourages autonomous learning, providing you with the opportunity for critical self-reflection or space for self-directed reading or research. 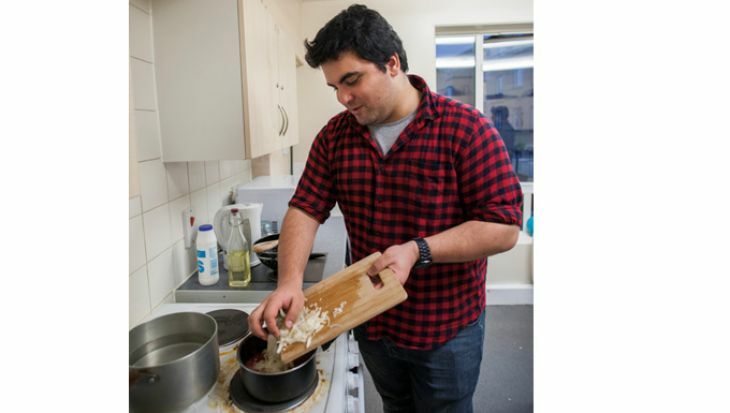 An example might be a research or practical project linked to a module's learning outcomes that you undertake independently or with a small group supported by your tutor. This might then form the basis for a seminar presentation. You will be taught through a combination of lectures, seminars, practical workshops, online activities, tutorials and external visits. Teaching in BA Digital Media modules is interactive and practice-based, so it takes place is small seminar groups, usually made up of 25 students. We often combine several types of activity in the same session. For example, a seminar might combine some lecture-like delivery with work in small groups, creative and practical tasks, and whole group discussions. Group or individual tutorials include structured, formal and informal feedback from your tutors on work in progress or on your ideas for a specific module assignment or project task. 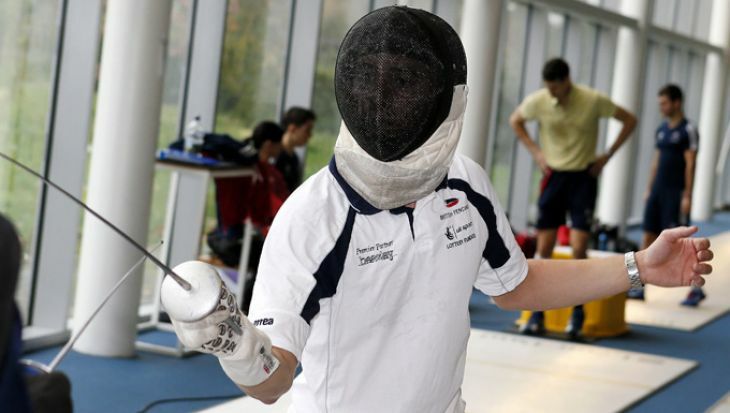 In addition, you can arrange one to one sessions with your personal tutor or module leader. You will also have access to and use resources to support your learning, including a free electronic textbook for every module throughout your course. There is formal ‘summative’ assessment as part of the module, usually towards the end of the module. Assessment methods could include a range of coursework including essays, reports, portfolios, your main final year project, and practical sessions including performance, such as individual and group presentations. The grades from the summative assessments count towards your module mark. Assessments are reviewed annually and may be updated based on student feedback, to suit content or based on feedback from an external examiner. Entry onto this course does not require an interview. Applicants without normal qualifications but who have extensive experience in digital media related areas may be considered through the University’s policy and formal process of Accreditation of Prior and Experiential Learning (APEL). If you are unable to meet the entry requirements for this course you may still be eligible for our Foundation year course. This is an extra year of study to prepare you for the full degree. For more information see our Foundation Year in Media page. Please apply via UCAS using this course’s UCAS code P307. For help with your application, please view our dedicated web page. How can the BA Digital Media support your career? Video and Blogging Community Management.